If there’s one spirit I could drink year round, it is most certainly tequila. Whether I’m enjoying a well-made margarita while grilling with some buddies or slowly sipping a glass of dark, oaky Añejo in the living room on a chilly night, it doesn’t matter what the occasion is. I could always drink tequila. 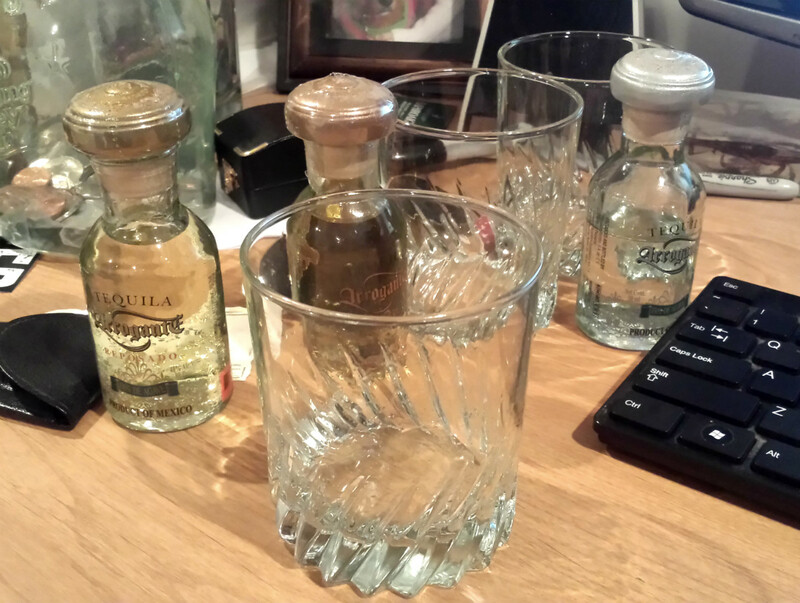 Blanco tequilas; these are clear because they are not oak aged. As I mentioned in my triple review of Arrogante Tequila, tequila is a spirit that a lot of people seem to be afraid of, and that fear always invariably stems down to one awful, overindulgent night with what might very well have been a sub-par tequila (maybe a mixto). Don’t know what a mixto tequila is? Don’t worry – I’ll explain that soon. 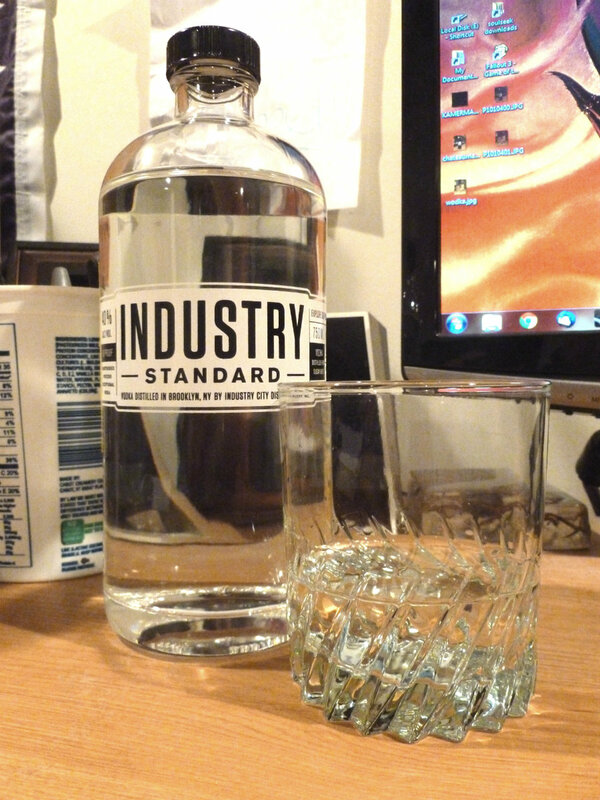 In the meantime, here are some basics on this delicious, yet misunderstood spirit. Reposado tequilas; note the pale yellow color. Blanco (“white”) or Plata (“silver”) – Spanish for “white” or “silver.” Blanco tequilas are clear because they are not oak-aged; after distillation and dilution, the tequila is immediately bottled. Blanco tequilas tend to have a fresher, spicier taste, and are generally used for mixed drinks, though many are smooth enough to sip. Reposado (“rested”) – Reposado tequilas are a bit darker than blancos because they’re aged for at least two months, but less than a year, in oak barrels. Oak aging adds a woody, smoky flavor to these tequilas, making them smoother and more suitable for drinking on their own, though they also do well in cocktails. Añejo (“aged”)- Añejo tequilas are aged between one and three years in oak barrels. 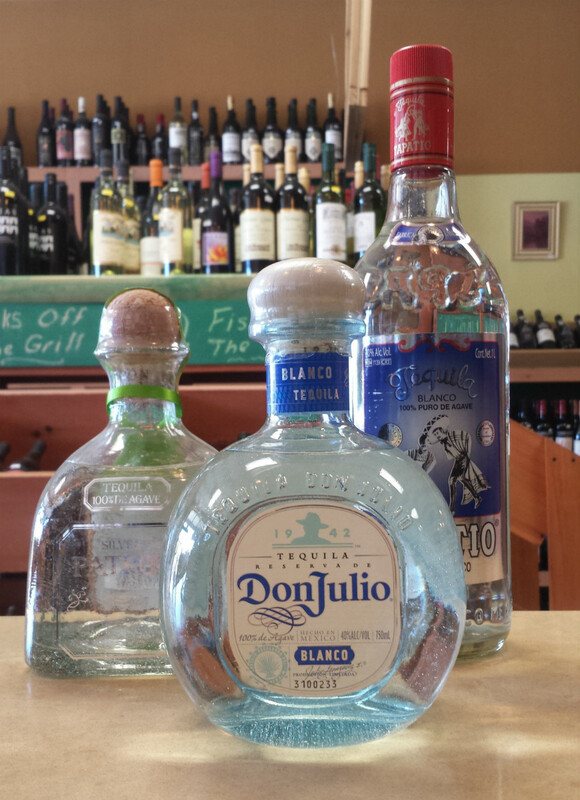 Añejo tequilas are darker, smokier, and more complex than blancos or reposados. Añejos are best enjoyed neat or on the rocks, though there are a handful of cocktails that call for them (like the Añejo Manhattan or Añejo Old Fashioned). 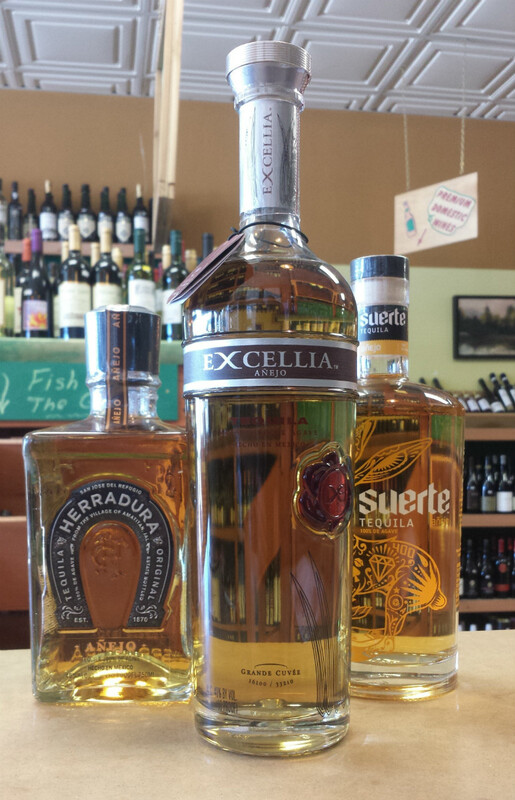 Añejo tequilas; the darkest, oakiest, and arguably, the sexiest of the tequilas. Extra Añejo (“extra aged”) – As you might have guessed, extra añejo tequilas are aged for longer than añejos (at least three years). If you’re used to drinking scotch, an extra añejo might be the tequila for you. There’s also a fifth category, joven (“young”) or oro (“gold”), which is used much less frequently. This category includes tequilas that are colored or flavored with caramel. Regardless of whether you prefer a peppery blanco, a smooth reposado, or a bold and complex añejo (or extra añejo, if you have that kind of cash), there’s a tequila out there for anybody who enjoys a finely crafted spirit. 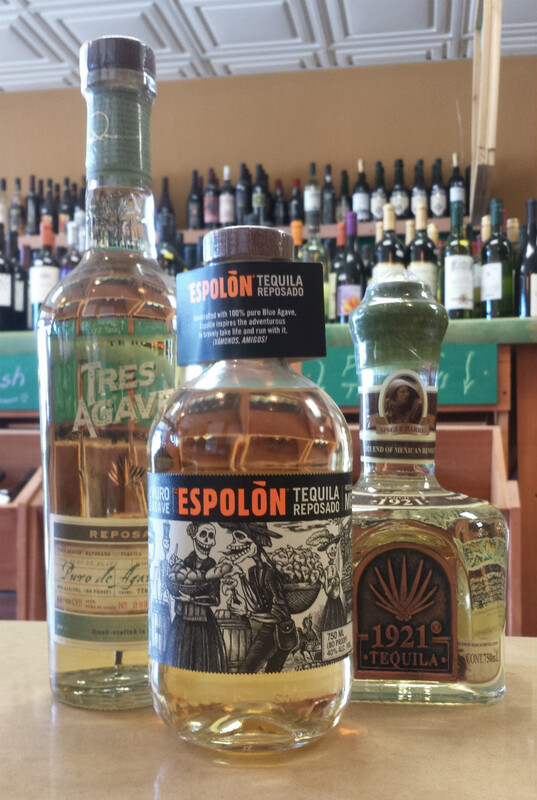 It might seem like a bit of a gamble to buy an entire bottle of something you’ve never tried before, but fortunately, there are plenty of affordable, high-quality options out there (my picks: Espolon Silver, 750mL – $26.99 + tax; Hacienda Vieja Reposado, 1L – $26.99 + tax; El Jimador Añejo, 750mL – $29.99 + tax; all 100% agave). There’s also plenty of information out there about pretty much every tequila ever (see: Tequila.net), but if you don’t feel like combing through it all yourself, stop by the store and we’d be happy to recommend one to you. Now if you’ll excuse me, this glass of Tapatio Añejo isn’t going to drink itself. Tequila is what I call a polarizing spirit – people either really love it, or they hate it to the point of being terrified of it. I’ve never met anyone who was just okay with it. Bring it up in a conversation with a group of friends and, chances are, a couple of them will recoil in horror and say something like, “I can’t touch that stuff, it makes me crazy,” or make a squeamish noise like you just pulled a dead mouse out of your pocket. Some of them might talk about their “bad tequila night,” and a long story about blacking out, getting arrested, and going to the hospital might ensue. 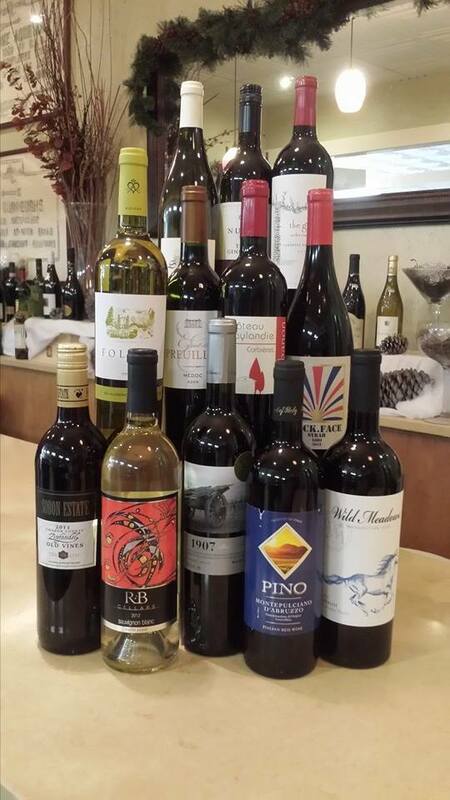 A handsome bunch of bottles, this. I never had a “bad tequila night.” I’ve drunk too much of pretty much every other spirit at one point or another, but never tequila. But I’m not foolish enough to think that the bad nights I had with vodka, bourbon, or whatever else, were a result of whatever I was drinking, rather than how much I drank. For some reason, though, tequila is one of those things people really don’t want to give a second chance, which is a shame, because there are few things more enjoyable than sipping a glass of delicious, well-aged tequila. Last night I had the opportunity to try the blanco, reposado, and añejo offerings from Arrogante Tequila, and I was reminded of just how much I love this oft-maligned spirit. Arrogante Tequila is distilled from 100% blue agave from the Jalisco highlands, using a process which, according to the manufacturer, is devoid of shortcuts. The agave is harvested, slowly baked in stone ovens called “hornos,” and fermented for 3-4 days. It is then distilled twice, and while the blanco is ready to go at that point, the reposado and añejo tequilas are then aged in used bourbon barrels. The name comes from the pride that results from producing such a tasty spirit – as their website explains it, “We’re so proud of the quality of our tequila, we called it Arrogante!” Anyway, without further ado, here are my thoughts on the line. Aging: Blanco: n/a; Reposado: 6 months; Añejo: 18 months. Clear with medium-thin, moderately paced legs and medium viscosity. Pale caramel tint. Nice viscosity with clinging, slow legs. Nice caramel hue with ultra-clingy legs. Whisky-like in appearance. Floral yet very clean nose, with just a hint of peppery alcohol. A bit more pepper and smoke on the nose, but not enough to totally cover up the earthiness of the agave. Lots of oak on the nose, along with some caramel or butterscotch, but still with some agave character. 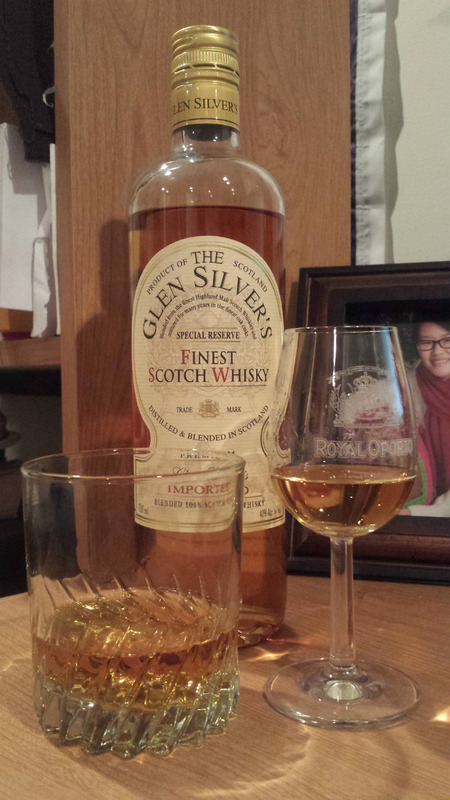 Super smooth and slightly smoky with a little bit of pepper and a lasting, subtle agave finish. This is among the smoother blancos I’ve tasted – not the most complex spirit, but a very enjoyable one. This is a no-frills blanco that tastes good on its own, but would really make a margarita shine. Soft and very slightly sweet up front. Much woodier than the blanco with some spicy pepper on the tip of the tongue. 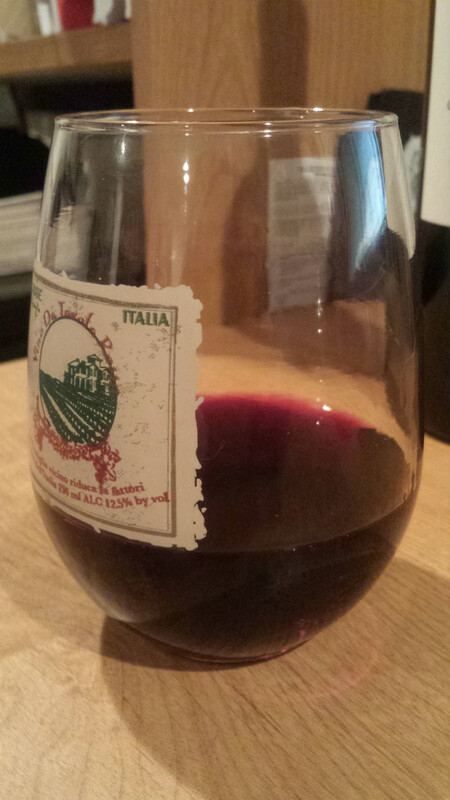 Long oaky, smoky finish. This is not your typical reposado; it’s not as fresh tasting as a lot of the others and has a lot more woodiness. This is a great sipper, though if you absolutely must mix it, it would be delicious in a cocktail. Smooth and a buttery; not a lot of sweetness to speak of, but lots of smoke and a little minerality on the finish. No burn whatsoever. Much sterner tasting than the reposado; not sweet, but smoother overall. This is the one that had me sitting back in my chair and wistfully staring into my empty glass, wishing I had more. “The Tasting Lab,” as I like to call it. It’s not a lab. It’s my desk. 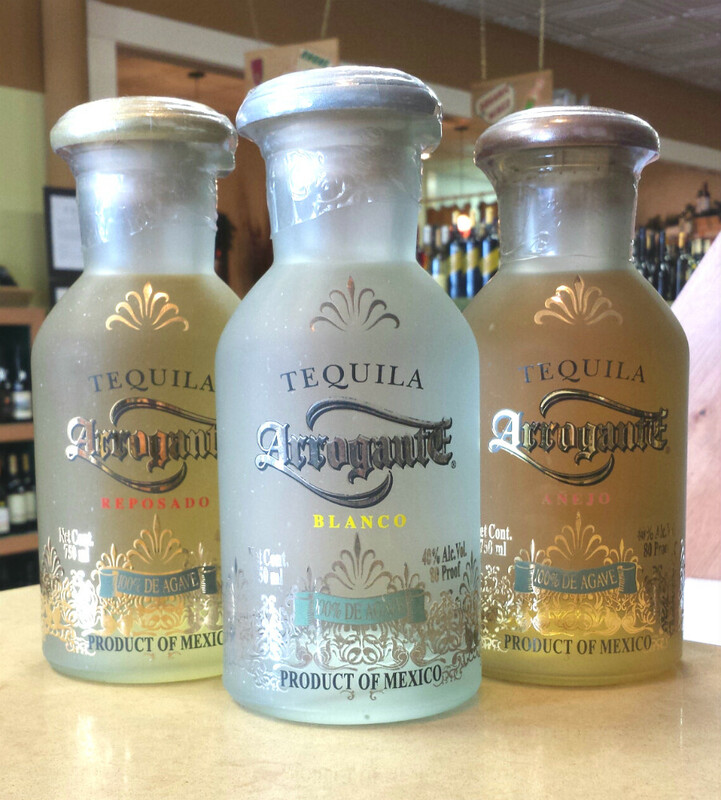 Each one of the Arrogante Tequilas I tried really exemplified its respective style, yet each also carried some of its own unique character. They’re complex enough to impress a tequila aficionado (particularly the reposado and añejo), yet smooth enough to act as an inviting “gateway” tequila for someone who isn’t too familiar with the good stuff. As with any high-quality tequila, to shoot it would be a waste; slow down, sip it, and enjoy. Have you ever had a drink and thought, “Man, this is so delicious that I feel like writing about it?” Maybe? Not really? Well coming from a cigar reviewing background, I definitely have, but after a few drinks, it’s difficult to get motivated enough to sit at the keyboard for however long it takes you to churn out a detailed description of what you just drank. But in the case of the Palmetto Apple Pie Moonshine, I was impressed enough to take some notes. Mason jars: the only way to package moonshine. Before I get started with this review, though, here’s a little background information on Palmetto Moonshine. 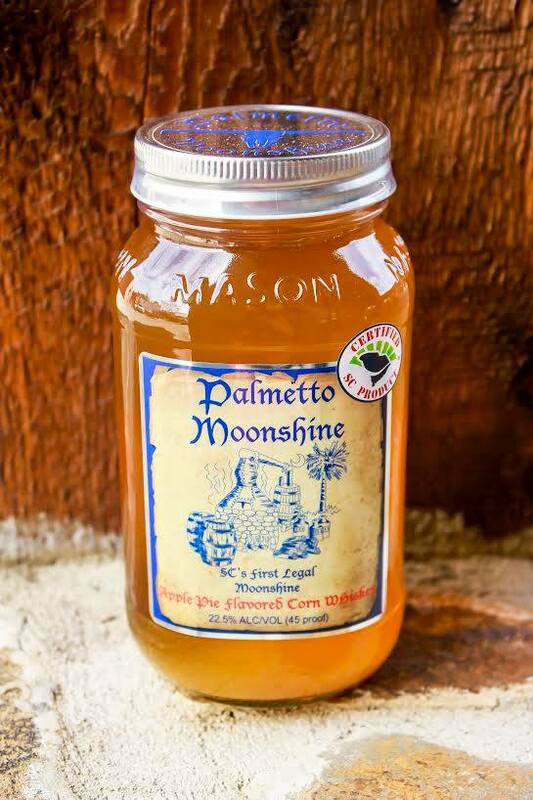 According to their website, the Palmetto Moonshine was founded in Anderson, South Carolina in 2010 by the Boggs brothers, Trey and Bryan, though they didn’t start making moonshine until the state legalized it in 2011. Their moonshine, which is available in several different flavors, is crafted using 100- to 200-year-old recipes shared by retired moonshiners, and is packaged in mason jars (just as it should be). And so, without further ado, here’s my take on the Palmetto Apple Pie Moonshine. As with the rest of the flavors, Palmetto Apple Pie Moonshine comes in a mason jar. This particular flavor has a fairly murky looking golden brown color, and at the bottom of the jar is a cinnamon stick and a nice amount of sediment. A good shake gives this moonshine the appearance of spiced apple cider. When served chilled, this moonshine didn’t have much of a smell, though you could definitely pick up the apple spice on the nose. At room temperature, the cinnamon and clove notes are a little more noticeable and the alcohol burn is just barely detectable, though at 45 proof, it’s not enough to be at all harsh. The first sip delivers pronounced baking spice notes – cinnamon, clove, and nutmeg – along with a buttery note that reminded me distinctly of pie crust (this buttery flavor becomes a lot more exaggerated when the moonshine is drunk at room temperature). The apple flavor trails behind the baking spice, and is followed by a little bit of classic corn whiskey bite. The finish is fairly clean with a little bit of residual baking spice. It’s moderately sweet, though not candy-like. As evidenced by the fact that it disappeared too quickly for me to take a decent picture of the jar (the above photo was borrowed from Palmetto Moonshine’s Facebook page), this stuff is dangerously delicious, though at 45 proof, you have to put in an effort to really overdo it. I imagine this would go very well on the rocks with a little bit of bourbon, and I imagine it would be delicious heated up, though I didn’t have the forethought to save some for either purpose. I highly recommend this moonshine, and I look forward to trying the other flavors.